In this modern world of technology, getting things we want has become very easy— too easy. We can get almost anything we want from Amazon or Ebay. We can order whatever food we want and it’s on our doorstep in twenty minutes. We can have unlimited free entertainment and a huge social network just sitting at home. The negative side of all this is that we have become too used to instant gratification in everything. This has reduced our attention span (a problem discussed widely in education systems), and we have become impatient. We carry this impatience forward to making dua– we want instant results, otherwise we lose hope. But eliciting Allah’s help is not like ordering pizza online. We can’t demand from Allah if He doesn’t answer; everything in the universe belongs to Him. He is our Rabb— even we ourselves belong to Him. If our prayers are not getting answers, we should think maybe there is something wrong with our attitude and our way of seeking help. Let us see how Allah the Master wants us to ask for help. Even before asking Allah for help, we need to cleanse our hearts of debris. Make sure that you have done everything that is possible by you. Even Maryam alaihi salam had to shake the tree before she was given its blessed fruits to eat while she was in labour. However, if we are having trouble with a particular sin, that shouldn’t stop us from seeking Allah’s help. We just do the best we can and then ask Allah to help us overcome our desires and avoid that sin. First of all pray the obligatory prayers on time and with concentration. Be aware of what you’re saying in prayer. Make prayer from the heart so that your eyes start watering. 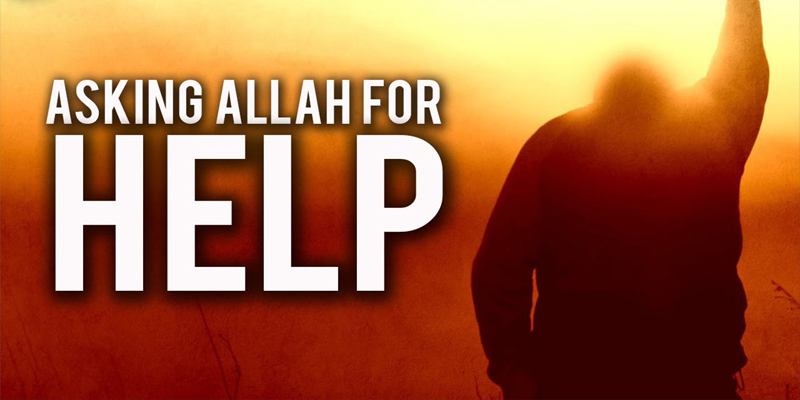 Allah has said in the above ayah that seeking help will definitely be a colossal difficulty except for those who have khushu’, i.e. consciousness of Allah. There are many special duas in the Quran and hadiths for specific purposes. Find the ones suitable for you and seek Allah’s help using them. Also call Allah by His beautiful Names while making dua. Although you can make dua anytime in the day, there are certain times which the Prophet mentioned are the best times for making dua. Seek out those times to make dua. One of them is during the last third of the night. The proper etiquette of making dua is first to praise Allah, then send peace and blessings upon the Messenger, and then ask for whatever it is that we want.